Sports fans will remember the glorious period in July and August 2012 when the nation was captivated by the spectacle of the Olympic Games. Even Londoners wore a collective smile as athletes fulfilled dreams in the sunshine. The London 2012 premiums programme represented a huge challenge, requiring suppliers to demonstrate fully Sedex and SMETA audited supply chains both in the UK and Far East. After months of work we fully complied with all aspects of corporate responsibility and secured a license. The agreement permitted access to corporate agencies representing the multi-tier sponsor programme giving a clear insight into their gifting needs, objectives and activation timelines. Our focus was on creating a broad spread of premiums that addressed key marketing activations before, during and after the Games. For example, we created solutions for event milestones (2 years to go, 1 Year to go etc. ), client invitations, guest welcome packs along with venue and event-specific gifts during the Games. Importantly, we created memorable Games related objects which corporate guests and VIPs would really want to keep. Over the three year license period we developed a strong partnership with the brand team at LOCOG, the event organising team. Our creativity and agile business model became an exemplar of UK design and manufacturing quality which was promoted in the press and media. In 2012 we were awarded two very special contracts. The first was to create a recognition gift for the 80,000 strong volunteer GamesMaker army. Such was the importance of the volunteer programme during London 2012 that the GamesMaker Baton that we created became the single biggest gifting programme of the Olympics. 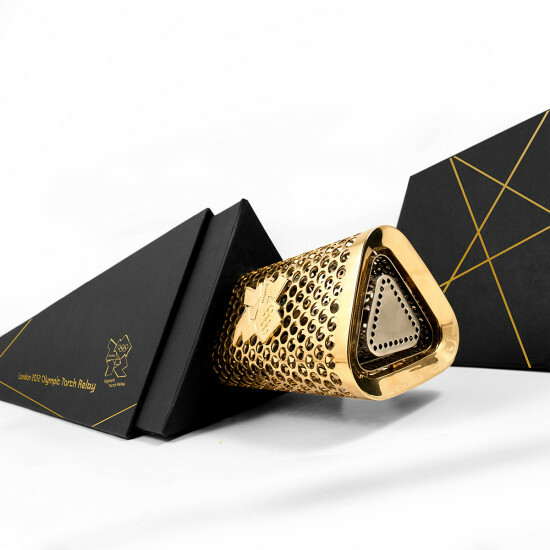 The second opportunity was to work with the suppliers of the Olympic Torch to design and deliver the Official Torch Stand and Torch Box, so iconic to the Games. It’s worth saying that some items we created for London 2012 have been much sought after by collectors since the Games…quality is always remembered. Torch Bearers who took part in the Olympic Torch Relay had the opportunity to purchase their torch after the Games and we were invited by LOCOG to design a contemporary Torch Stand to compliment it. We came up with an elegant ‘v’ shaped design in polished die cast aluminium that provided a stable display platform, smart enough for board rooms, club trophy cases and home display. In all we produced over 4000 stands which could only be purchased online through a dedicated website. We also offered a laser engraving service for those Torch Bearers wishing to personalise their stand. The way a thing is packaged has an enormous impact on the perceived value of an object. 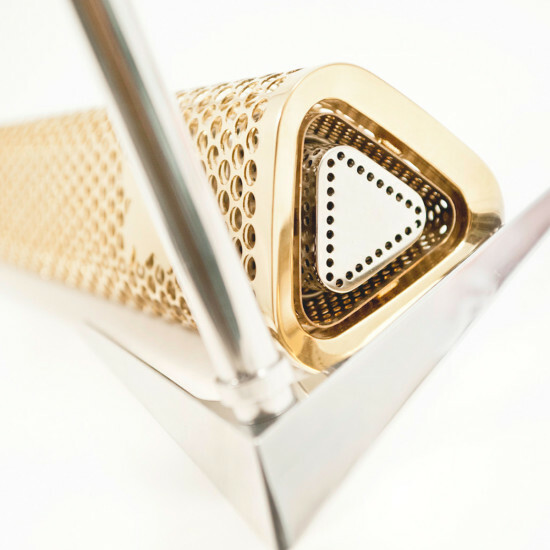 We were asked by LOCOG to create a unique case design that would both protect the torch in transit and provide real wow factor when opened. 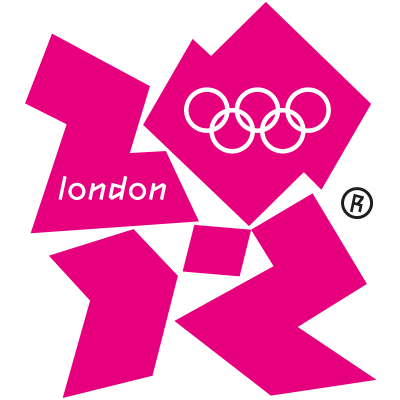 Our solution was a very distinctive tapered triangular case or ‘shard’, a key visual style theme developed for the look and feel of London 2012. Finished in matt black with gold block foiling, the case proved a popular accessory for Torch Bearers who purchased over 600 units through our dedicated online service. In early 2012 we were asked by LOCOG to discuss a suitable recognition gift for the GamesMaker volunteer programme. The gift needed to be relevant and meaningful to the volunteers who gave their time to make the event happen. LOCOG were about to move forward with a keyring; we all agreed this solution lacked inspiration and sporting relevance. 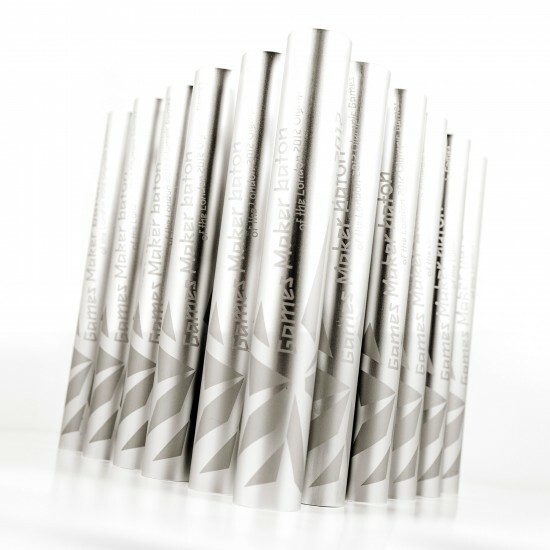 We proposed a souvenir relay baton in satin aluminium with a bold wrap-around graphic. The relay baton (which symbolises trust and teamwork) was loved by the GamesMakers. The baton was IAAF regulation size and weight which meant you could run a relay with it although most were given pride of place at home. In all we delivered over 80,000 GamesMaker batons with a further 20,000 produced to a different graphical design for the British government who gifted it to visiting dignitaries to the Games. G4S, the security specialist, wanted to thank their staff for their support during London 2012. We were asked if we could design a unique individually personalised certificate that could be cost effectively mailed out to 15,000 individual home addresses. 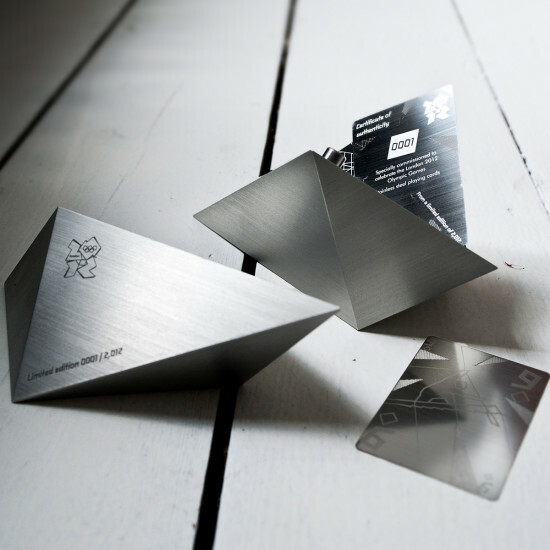 We developed this stylish pop-up origami steel athlete in etched stainless steel fitted to a display carrier card along with a personalised certificate. 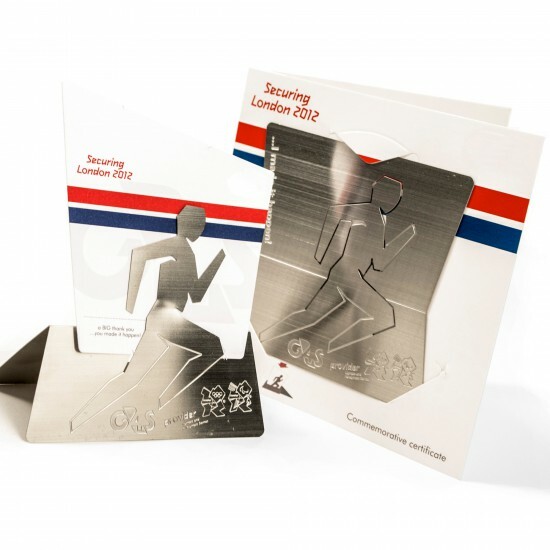 The etched stainless steel origami figure folded up by the recipient to form a certificate holder; a unique memento of the Games. We handled the entire project from initial idea through to fulfilment and dispatch to addresses throughout the UK. Stainless steel is a versatile material; it has an enduring premium quality finish that is hard to beat. 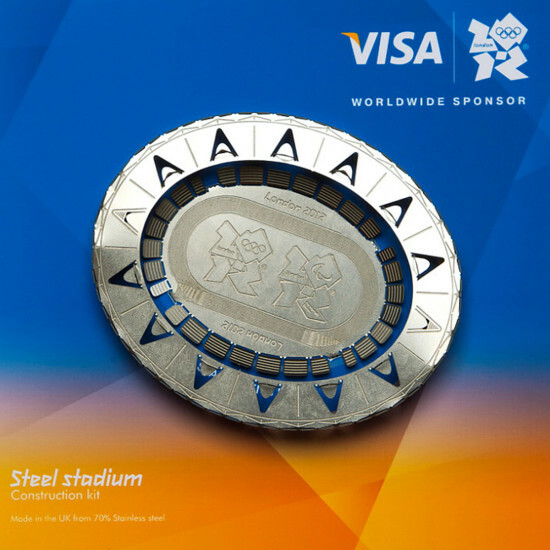 Visa, a Worldwide Olympic Partner, wanted to celebrate the opening of the Olympic Stadium at Stratford so we proposed a cool origami construction kit in etched stainless steel. The stadium image is etched into a flat steel sheet along with construction slots and fold lines. The kit was neatly packed along with socket screws and easy to follow instruction diagrams that allowed the recipient to fold up the stadium in moments to form a cool 3D model; a really smart souvenir of the Games. Lloyds, a top tier sponsor, came to us with a challenge. They had 60,000 Olympic pin badges which were out of date; could we re-purpose them? We suggested making a sculpture from them, or alternatively we could melt them down and turn them into something else. The latter option was favoured so we proposed converting them into 100 ingots resembling bullion bars, an idea that really appealed to Lloyds as a bank. We smelted the zinc badges at a foundry in Birmingham and re-cast the material into gleaming nickel plated ingots. With laser etched graphics, the ingots looked so smart that Lloyds gave one to each of their top 100 clients visiting the Games. It is actually possible to make a full deck of playing cards out of stainless steel. Although we had no client in mind,’ we set out to make one of the iconic merchandise pieces of the Olympic Games. The beautifully crafted playing cards featured pictograms of all the sports hosted at the Olympics and Paralympics whist the picture cards were decorated with famous London landmarks. Each deck was encapsulated in a stunning solid aluminium ‘shard’ shaped casket machined from solid aluminium. Each piece is hand crafted and numbered, taking four days each to machine; a truly exceptional limited edition souvenir of London 2012. Nielsen, a global US information and measurement company, was seeking to gain an edge over other sponsors wishing to invite global CEOs to the Games. Getting an invitation past the top PAs in the business required something exceptional. 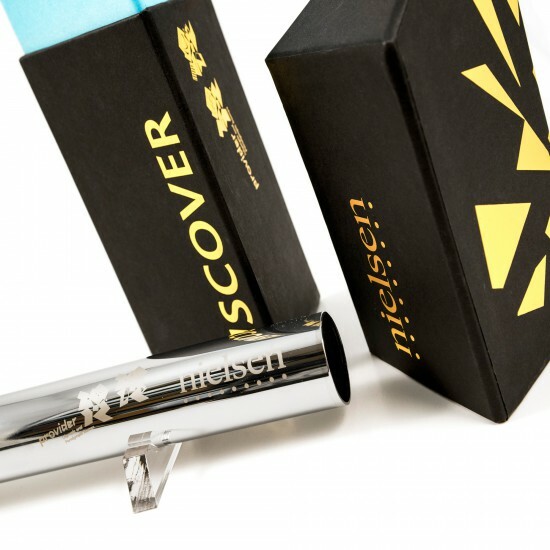 We proposed delivering the invite rolled inside chrome plated brass relay baton…it worked and Nielsen was delighted with the invitation acceptance rate. 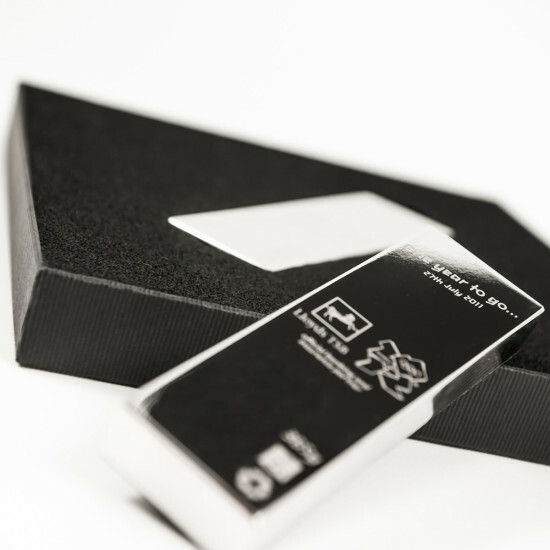 The triangular black presentation box guaranteed attention and to make it extra special, the invite itself was printed on a cloth paper that stayed flat after coming out of the baton. Sponsors could choose from a collection of five steel athlete kits developed by us for London 2012. 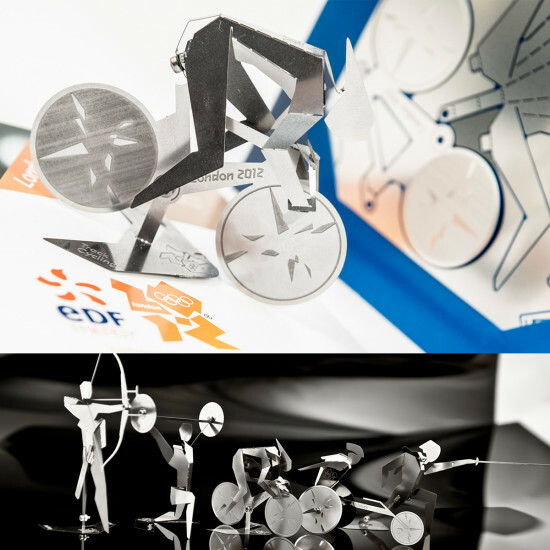 EDF, the French energy giant, chose the Track Cyclist presentation pack for a staff recognition gift; they loved the quirky nature of our designs. The cyclist was etched in a flat stainless steel sheet with twist out profiles and etched fold lines. Each kit came complete with socket screws, allen key, spanner and assembly instructions to enable the recipient to build a very cool collectable 3D model. The Steel Athletes concept was totally scalable; we wanted to demonstrate that the designs worked for desk top sized kits all the way up to full size athletes in welded steel plate fit for a corporate HQ foyer. We also envisaged giant park sized sculptures including swimmers for the Serpentine and archers in Hyde Park. In the end we manufactured a number of life size track cyclist sculptures which were auctioned at the end of London 2012. 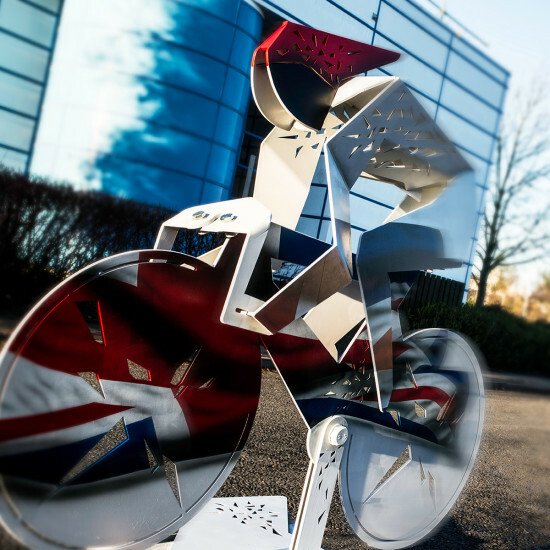 Each piece was endorsed by Olympic legends including Sir Bradley Wiggins and Sir Chris Hoy, their signatures etched into stainless steel plaques fixed to the sculptures. Each sculpture weighed in at an impressive 400kg!